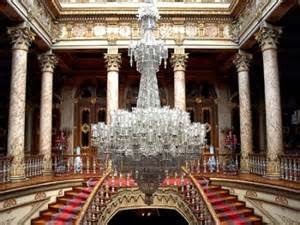 This palace is today an incomparable museum of Ottoman wealth and splendour, beautifully laid out in the rooms. With one of the most fabulous settings of any palace anywhere, the Topkapi stands on the promontory jutting out between the Bosporus and the Golden Horn, the first hill of the Seven Hills of Istanbul. The palace has four courtyards, and the entrance to the first one is marked by the fabulous free-standing rococo street fountain of Ahmet III with its own overhanging roof. 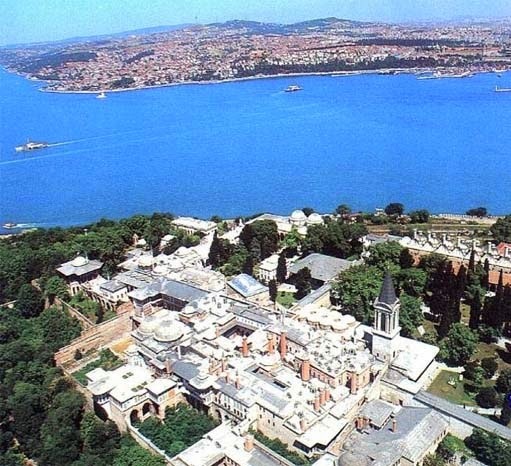 Built in 1728, it is the most beautiful and elaborate Ottoman fountain in the city, as befits its location. 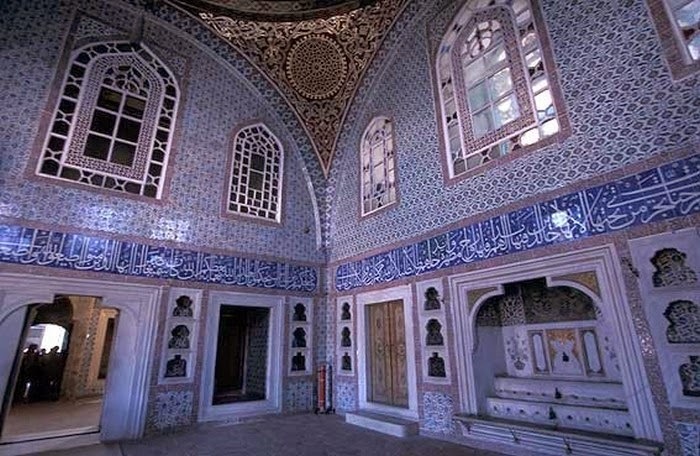 The ticket office lies within the first court, the Court of the Janissaries, where the sultan's elite military corps of slave soldiers was stationed. In the extreme southeast corner stands the impressive basilica of Aya Irini. During confidential meetings with officials and dignitaries, the sultan would instruct that the fountains be turned on so that no one could overhear their discussions. visit turkey and book All Iclusive holidays to Turkey. The entrance to the third court is flanked by two magnificent octagonal towers. The main walkway through is lined with cypress trees, two of which have curiously interbred with a fig and a plane tree to form hybrids. Byzantine cisterns run under this walkway, and traces of the red brickwork can still be seen under the paving. The harem lies over to the far western end of the courtyard and the separate ticket kiosk stands outside it. Little is really known for sure about life in the harem. Much is gossip and hearsay. The women were guarded by black eunuchs, and even the chief physician was only allowed to inspect his patients' hands. The lucky woman in favour on any particular night would be summoned to the imperial bedchamber, told to kiss the imperial coverlet at the foot end, then wriggle her way under it to encounter the sultan. No Turkish woman is thought ever to have had this honor, only thousands of Caucasians, Georgians and Armenians, and a handful of Western Europeans. Murat III (1574-95) had 1,200 harem women and fathered 103 children by them. Problems inevitably arose in such circumstances about how to decide the succession, and the usual Ottoman solution was wholesale slaughter of the other contenders by the eldest. 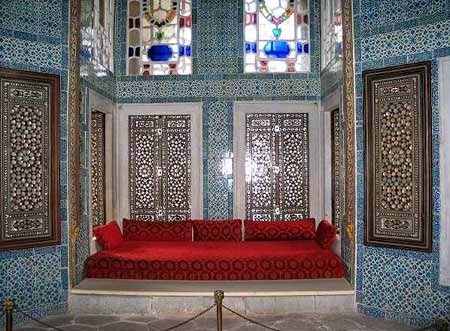 When this custom was thought to be getting out of hand, a new method was introduced of locking up the younger brothers in the royal prison within the Topkapi, known as the Kafes. One of the busiest halls in the palace is the Pavilion of the Holy Mantle, containing Muslim holy relics captured during Selim the Grim's campaign in Egypt in the 16th century. In addition to rare examples of the Qur'an, these include a lock of Muhammad's beard hair and a cast of the footprint he left as he ascended into heaven. kiosks and terraces with fabulous views, where the restaurant and cafe make lingering even more of a pleasure. Sultanahmet. Tel: (212) 512 0480. Open: Wed-Sun 9am~5pm. Admission charge. There is an additional charge for a tour of the harem, queued for and bought separately inside the palace, and the Treasury. Tours of the harem leave every 30 minutes, 9.30am-3.30pm.